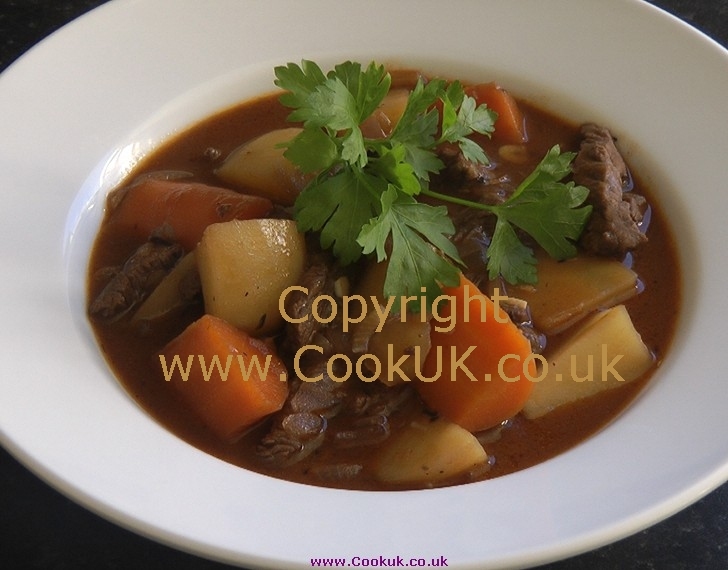 A stew is a dish which has been cooked on the the oven hob rather than in the oven (which would be a casserole). It is the best method for tenderising tough cuts of meat. The first step in this recipe is to marinate the beef in some olive oil, Worcester Sauce and salt. 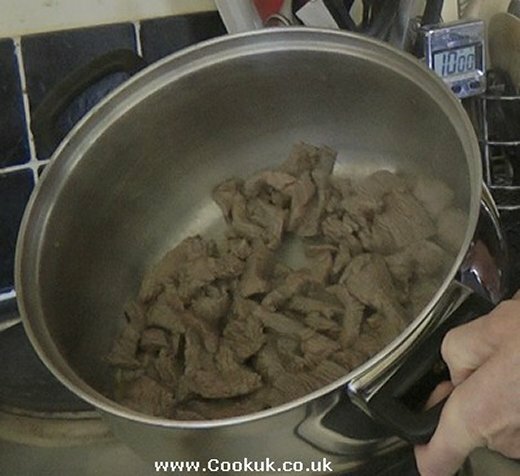 This is an essential step if you want your beef to stew to perfect tenderness. The art of marinating something like beef is not often understood. In the case of this beef stew recipe, the marinade will tenderise the stewing steak in a way you would never believe possible. Combine that with a long cooking time and your beef stew will be the envy of your friends. 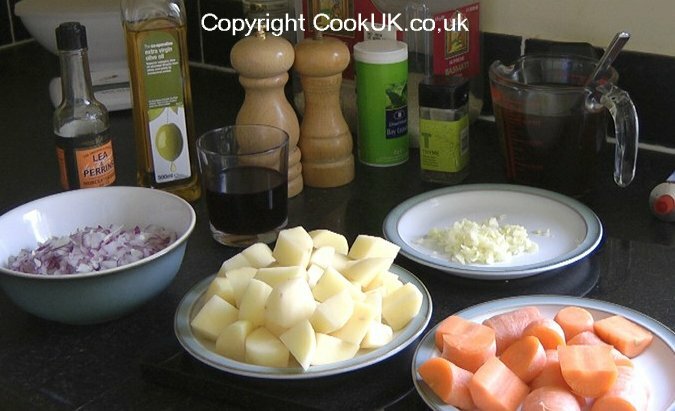 As far as the vegetables are concerned, the onions and potatoes are essential for beef stew but the carrots can be replaced with any seasonal root vegetable of your choice. Parsnips or turnips are ideal. Beef stew freezes extremely well, many believe that freezing helps the meat take on the flavour of the other ingredients. For the beef stock, use homemade beef stock if you have any although that's unlikely. 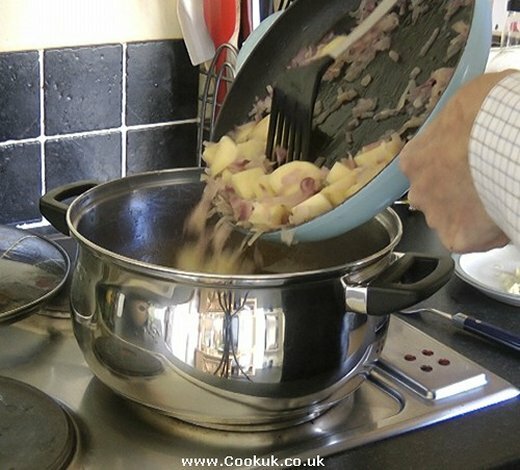 If you don't have any, simply use hot water with a couple of beef stock cubes dissolved in it. One final word of advice is that beef stew goes perfectly with dumplings. Now that may seem a bit complicated but they really are very simple and almost foolproof. Just start them half an hour or so before you want to serve up the beef stew. Click here for our dumplings recipe. A large pan and a frying pan (skillet). Chop the stewing steak into 3cm (1in) cubes. 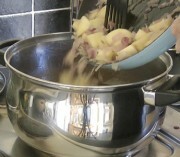 Peel then roughly chop the potatoes into 3cm (1in) cubes. Peel, top and tail then finely chop the onions and the garlic. Roughly chop the carrots (see picture below). 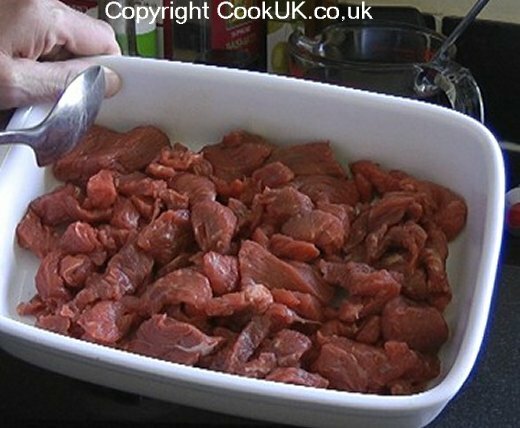 Place the beef cubes in a bowl, add two tablespoons of olive oil and the Lea and Perrins Sauce. 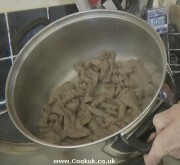 Evenly sprinkle the level teaspoon of salt over the beef. Mix the contents of the bowl together well with a fork. Cover with cling film and place in the fridge to marinate for 15 minutes whilst you are preparing the other ingredients. 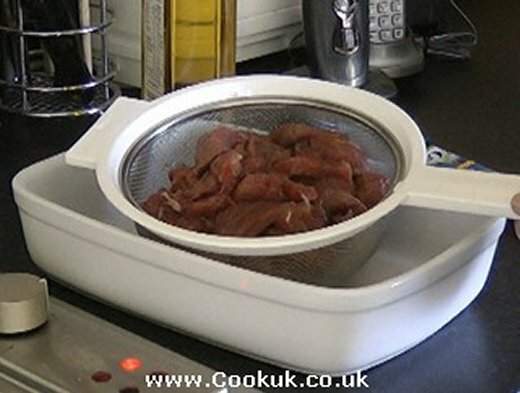 When the beef has marinated for 15 minutes take it out of the fridge and place it in a colander. Rinse the marinade off all the beef cubes by running water over it for a minute or so. 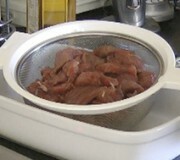 Turn the beef cubes whilst rinsing to ensure as much of the marinade is removed as possible. 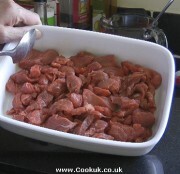 The main purpose of the marinade is to tenderise the beef rather than flavour it. Add two tablespoons of olive oil to a large pan on a medium heat. Add the beef and stir for three minutes or so until all the beef is browned. This is known as "frying-off". Add the stock, wine, bay leaves and the tomato concentrate. Stir the mixture well and turn the heat to low. 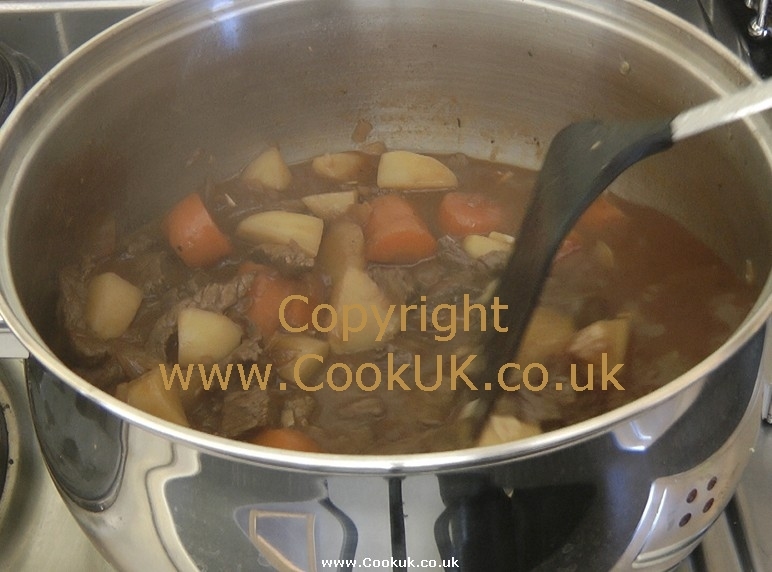 Leave the beef to stew like that for 2 hours stirring every half an hour or so. Halfway through that 2 hour stewing time add the carrots to the beef stew. 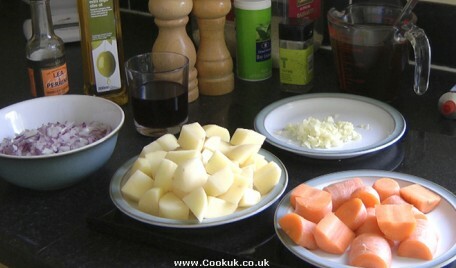 The carrots are added earlier than the other vegetables because they take much longer to cook. About 15 minutes before the beef has finished stewing, add the butter to a frying pan / skillet on a medium heat. Add the onions and let them fry for five minutes turning them frequently. 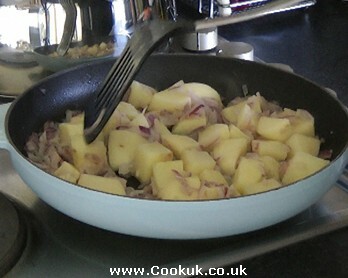 Add the potatoes and fry the potatoes and onions for another five minutes. Turn frequently to ensure the ingredients are evenly cooked. When the potatoes and onions have fried, add them to the beef stew. Then add the chopped garlic, thyme, sugar and a good sprinkling of pepper. Test the beef stew for salt seasoning. Depending on how well you rinsed the beef marinade earlier, you may need to add a touch more salt. Leave the beef stew to cook for a further 1¼ hours on a low heat. Serve into soup bowls and garnish with parsley if you have any. Beef stew freezes particularly well, simply warm it up from frozen.